During the reign of Brion and Ysabella, Prince and Princess of the Mists, it was determined that the Principality lacked a sword of state. Determined to ensure that the Principality would go no longer without such regalia, His Highness embarked on a mission to have a sword created that would rival any sword of state in the Knowne World. 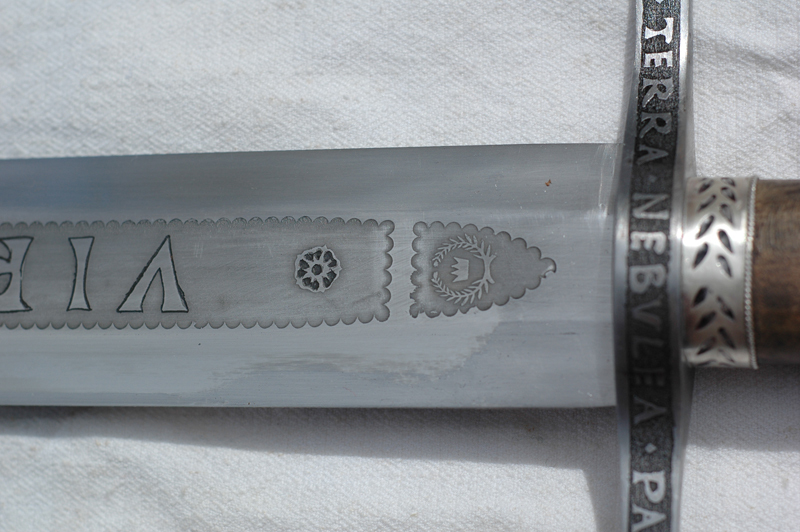 The original Swiss blade was etched with German text and had wonderful scallop detailing that outlined the words. This suited the design concept for the Mists blade, especially the scalloping, a detail that also appears in the arms of the Principality. It was decided that the Sword of State for the Principality of the Mists would have a motto etched into each side of the blade: one side for the Prince and the other for the Princess. This refers to the Mists being the first organization in the SCA. This side of the blade is also etched with a Sea Wolf bearing a lance near the tip of the blade, and the arms of the Mists near the hilt. 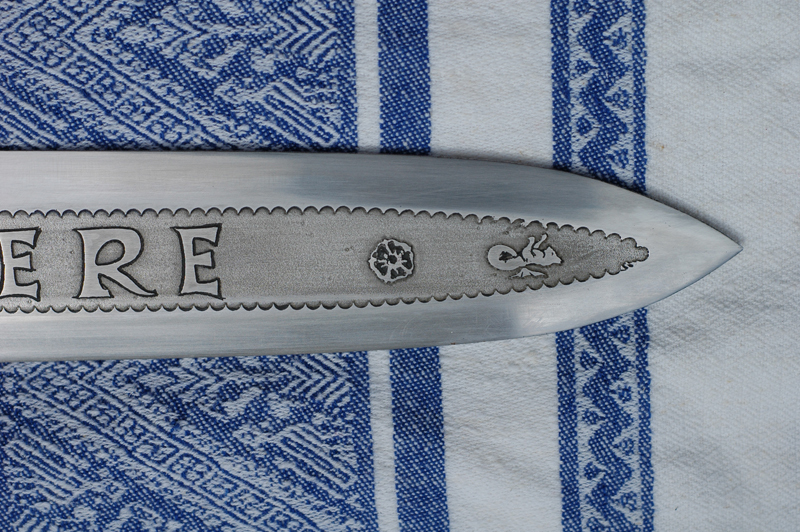 This side of the blade is also adorned with a Sea Wolf and etched roses. elements that were etched upon the blade and hilt. adorns the pommel and assembled the sword. The sword was forged from a single block of steel over the course of several days. The blade was initially forged into shape then file work commenced to clean up the profile and the bevels in which the etching would be contained. The blade was polished by hand prior to being etched, and again after etching was completed to remove any unwanted marks. Once the blade dimensions were finalized, the hilt was forged from the same steel. The slot for the sword was cut to exactly the dimensions of the blade to provide a secure and lasting fit. The pommel was also forged from the same metal, and was turned on a lathe to true up its dimensions. The shape and the undercutting for the handle rings were also cut into place on the lathe. The pommel was then heat blued. The coronet that adorns the pommel was crafted from silver and is similar to the actual coronets of the Mists in design. It is a three part composite with an inner circlet contained within an outer circlet edged in a twisted silver wire. 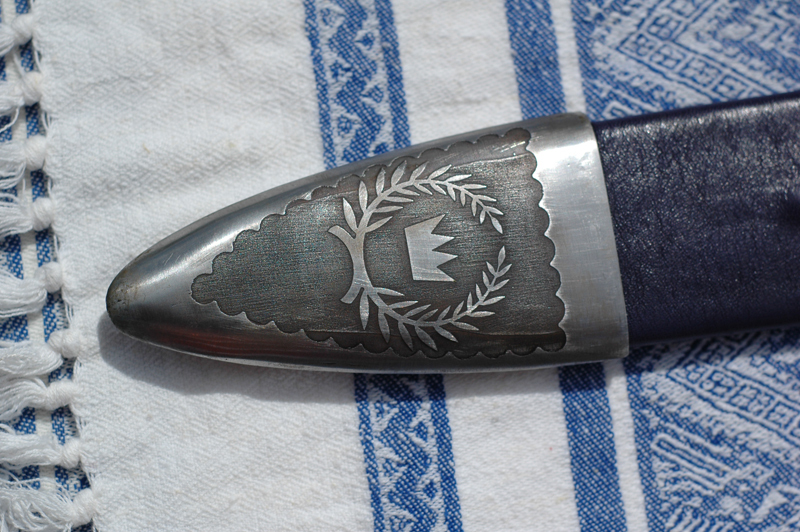 The coronet is silver riveted to the pommel with six hidden rivets of silver. The handle was carved to fit the tang of the blade from cherry wood that was seasoned for seven years. 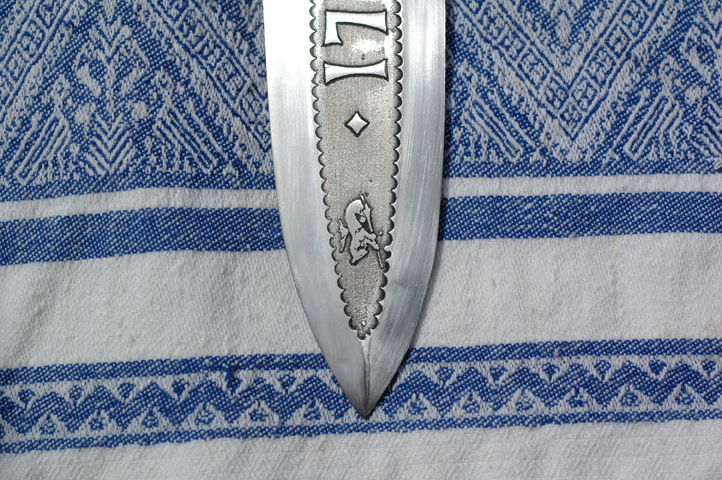 Once the handle was mounted on the tang of the blade, the bands of silver were fitted to it. 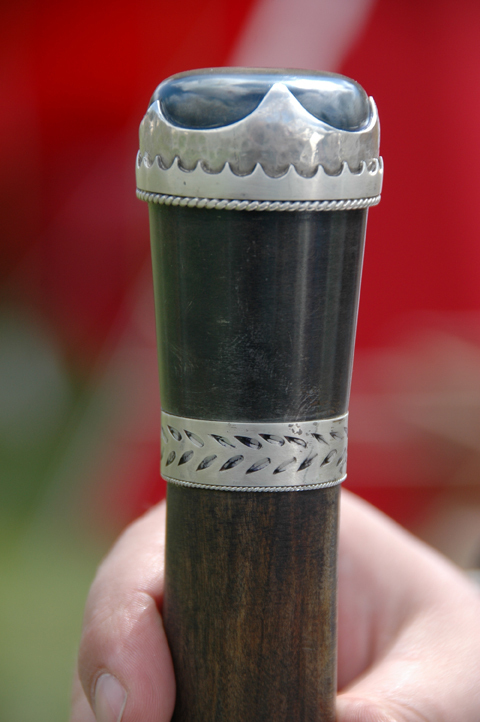 The pommel was undercut by half the width of the ring and as thick as the thickness of the silver bands in such a way as to hide the actual seam between the wood and the metal. The twisted silver wires that compliment the rings were drawn out from silver that was left over after making the pommel’s coronet. Once all of the component parts were completed, they were assembled and permanently affixed to the blade. Rumor has it that beneath the bands of silver and the coronet there may lay secret incantations engraved into the metal: “One ring to rule them all…” or something like that. *All photos courtesy of Martin of Rivenstar. Thanks to Master Fionn for permission to reproduce his essay.